The percentage of Australians donating to charity is falling, according to new research that experts say highlights a need for different giving strategies in the sector. Roy Morgan’s Single Source survey, which is based on face-to-face interviews with more than 50,000 Australians during 2018, found only 60 per cent of people donated to charity over a 12 month period, compared to 61.8 per cent last year and 66 per cent in 2014. The average amount donated has only grown from $460 in 2014 to $486, which represents a decline in real terms after allowing for inflation. Source: Roy Morgan Single Source (Australia). Roy Morgan’s industry communications director, Norman Morris, said this decline in donors was an emerging problem for charities. He said charities were largely reliant on donations from the over-35 age groups, with the highest average amount given being from those aged 50 and over. “While it is likely that the younger age groups have lower incomes and other priorities which impacts the amount they could give, their incidence of giving is generally well below average and as such represents a major growth potential for donor numbers,” Morris said. The research showed donors from high income households gave the lowest proportion of their household’s income to charity. 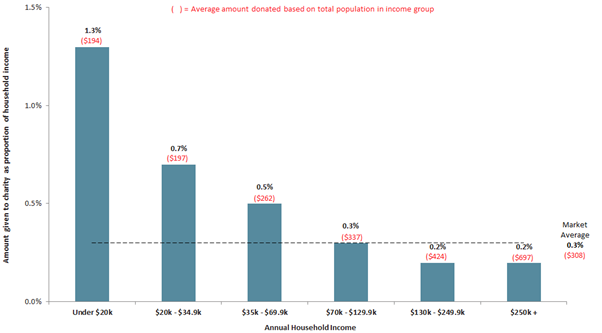 Households with incomes of $130,000 or over donated 0.2 per cent of their household income on average, compared to 1.3 per cent for households with incomes under $20,000. Morris said the greatest potential for increasing the overall level of donations was to focus more on higher income households. “They are not only more likely to have the means to give but donors from these households are currently giving a lower than average proportion of their households incomes to charity,” he said. 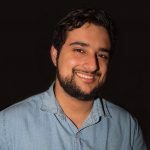 Roy Morgan’s research echoes findings from a 2018 report from QUT’s Australian Centre for Philanthropy and Nonprofit Studies (ACPNS). This report said the percentage of Australian taxpayers making deductible gifts has been in decline since 2011-12, decreasing from 34.58 per cent in 2014-15 to 33.4 per cent in 2015-16. 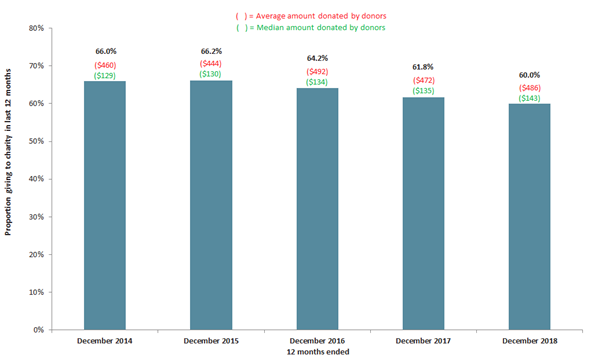 The Giving Australia 2016 project also found the percentage of Australian donors has declined since 2005. Giving expert Wendy Scaife, director of the ACPNS, told Pro Bono News this decline in donations was a concern not just in Australia but evident in giving studies around the world. She said it was clear charities needed to facilitate generosity that matched people’s/employees’ means to give. “Giving Australia and other studies show the strong nexus between volunteering and later financial giving for instance,” Scaife said. She said these results also pointed to the role for collaborative giving in improving outcomes – through things like giving circles, schools, families and workplaces. She added providing easy structure to giving was also something that might nudge the participation needle. “Whether it is a sub-fund in a community foundation or trustee company or a regular gift set up each month, giving that is easy, manageable in chunks, and a habit, is powerful and helps charities keep costs down and gives them predictable income streams,” she said. Instead of giving to charities, I give to my friend who goes to Cambodia every three months for three months and she gives the money directly to extremely needy people in the form of support such as bikes, paying for surgery, and contributing to the building of toilets, that kind of thing. None of my money is wasted. The reason I stopped giving to charities here is, after giving a small donation, I would be inundated with emails and requests through the post. Worst of all, they’d send me gifts (cards, return address labels, reusable shopping totes, fridge magnets, pens, you name it, which would completely wipe out my donation and lump me with with a lot of stuff that ends up in the trash. I’ve written to these organisations that do this, and they say it works. Well, I reserve my opinion that it doesn’t, at least not with me. Another reason I think, is that generally, people simply don’t have the spare cash they once had. And there are plenty of reasons for that. Plus the fact that so much of your donation goes to admin… For now, I’m happy to give my entire donation allocation to my friend and I can see real improvements in people’s lives as a result. Shame about the other worthy charities though. FEWER Australians are giving to charity. Take note of the headline error commonly used these days. I was on the committee of a charity which closed last year due to fifficulties finding enough funding to even exist. In an effort to become more attractive to donors and those who could use our support, it was decided to change the name of the charity, much to the horror of some of us. It was a complete flop and by trying to be too clever they alienated all the members and lost support. In today’s competitive climate we had no hope of survival. Instead I have gone back to basics and keep my support group going with no need for more than a donation of $5 at the door. Personally I dislike all the gifts and glossy appeal brochures which regularly appear in my letterbox, as this total waste of money is coming from donors who want to support the work of the charity rather than have it wasted on free gifts. Consequently I am not likely to support these charities. On my limited income it would be very difficult anyway, and I hate the pushy people who expect everyone to have a job and to be able to donate “only” $50 a month! It makes me feel more alienated from society. Thank you for the work you do. What is surpising is the finding about higer income earners giving away the lowest proportion of their income. Many would have presumed that the opposite would be true and that higher income households would in fact give a greater portion of their income. Obviously, this is not the case.